USDA NRCS Listening Sessions on Wetlands | Lawler & Swanson, P.L.C. On July 28, Lawler & Swanson, PLC attorney Luke Jenson attended the Iowa NRCS Listening Session in Ankeny. The following are modified notes he took at the meeting (the graphics were handouts by the Agency during the session). Jay Mar, Iowa’s State Conservationist for NRCS, noted the purpose of the session was to focus on two major topics: 1) vetting of off-site procedures for wetland determinations; and 2) mitigation banking for producers whose land contains wetlands. 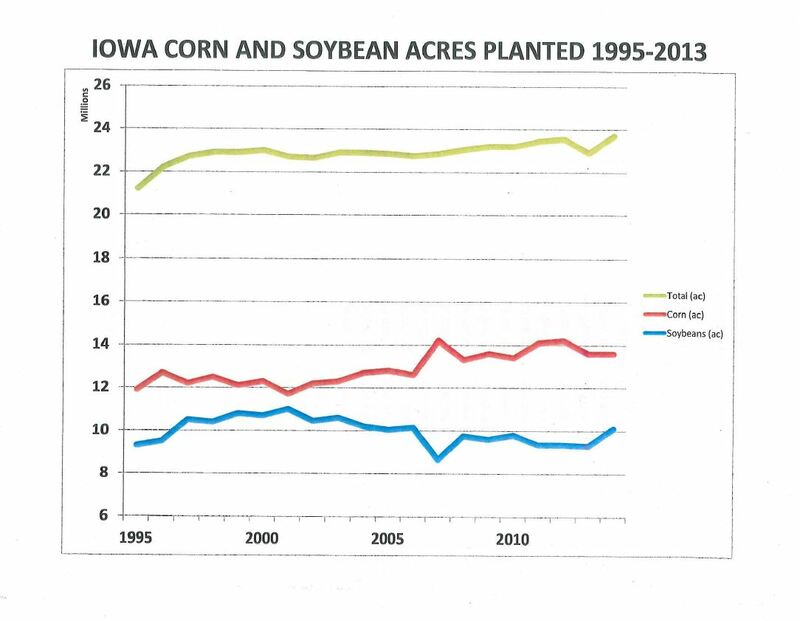 Mr. Mar placed the session in its historical context: In Iowa alone, over 2 million acres of land has been expanded for soybean or corn production since 1995, an increase of nearly 10%. During this time, the amount of wetland determination requests received by state NRCS offices in the Prairie Pothole Region (which includes portions of Iowa, Minnesota, North Dakota, South Dakota, and Montana) has also significantly increased, and NRCS offices continually find themselves with a growing backlog. For instance, the backlog in South Dakota has been particularly notable, which explains why the South Dakota NRCS Listening Session had over 10 times as many attendants as Iowa. 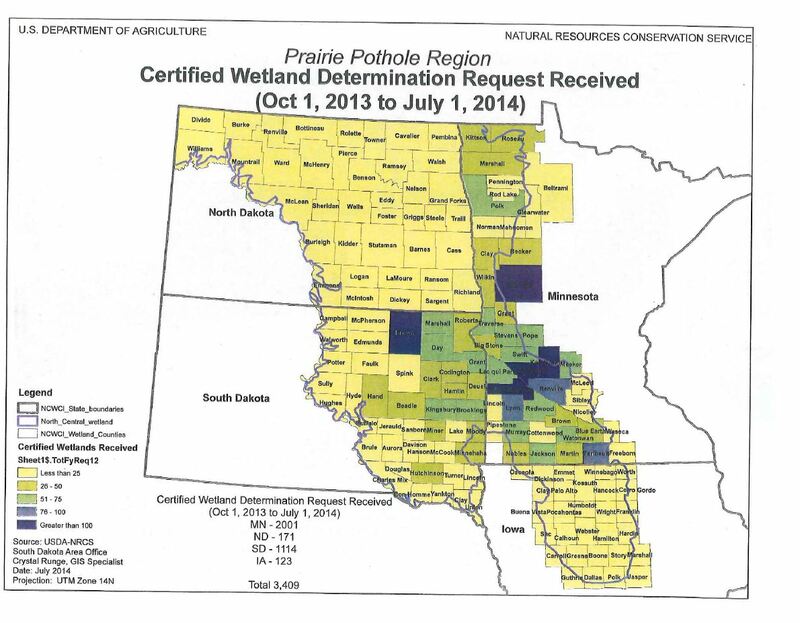 NRCS offices in the Prairie Pothole Region received over 3,400 requests from Oct. 1, 2013 to July 1, 2014 alone. This explains why the NRCS is looking at improving efficiency measures for the agency’s future. A big target is on off-site procedures, which allow for a quicker determination of wetland using maps, aerial photographs, and geographic data, without having to personally examine the field in question to see if it indeed contains a wetland. Paul Flynn, the State Resource Conservationist located in Minnesota, noted that today’s off-site procedures, authorized by 7 CFR 12.30(a)(4) of the Code of Federal Regulations, stem from the late 1980s. State offices have developed a hodge-podge of off-site methods (“Mapping Conventions”), and NRCS officials have started to propose that the states in the Prairie Pothole Region use consistent, if not the same, procedures. By moving toward a consistent regional approach, the NRCS would abandon any of the current state mapping conventions that are in use today. Mr. Flynn went through the current scheme of wetland identifications for the agency, including the use of indicators by the agency to identify a wetland. A more consistent, regional approach to indicators, said Mr. Flynn, would provide some important benefits, including: 1) allowing the Agency to incorporate use of newer and better technology, such as remote sensing technology (e.g., LiDAR); 2) increase the efficient of findings without sacrificing accuracy; 3) reduce the field work associated with wetland determinations and 4) provide quicker results for farmers. Much of Mr. Flynn’s presentation was the nuts-and-bolts of current wetland determination practices, and most farmers who have been through a few rounds with the NRCS would be knowledgeable about the process. Essentially, the practice for each determination is typically: 1) gather off-site references, including the National Wetland Inventory, soil surveys, LiDAR or USGS topographical maps, and aerial photography; 2) create a base map with sampling units, and identify the sampling units within a 30 year period for normalized years; 3) examine the data for surface water, color tone differences, and other wetness signatures; 4) gather information about the potential hydric soil and vegetation of the land; 5) make verifications with the farmers; and finally 6) make evaluation and issue determination. New procedures are going to be developed internally by the NRCS, but nothing was specifically mentioned at the listening session. The public should expect comments to be presented in the federal register in late September. Following that, there will be a state technical committee meeting to establish any new procedures. Mr. Flynn and Mr. Mar opened up the session to questions and comments. Several commentators questioned the accuracy of current aerial photography for wetness indicators, as well as the practice of examining the photography. However, Mr. Mar noted the costs of updating the photography as being a significant burden for now. Another topic of interest was the recent EPA proposal of jurisdictional involvement in wetlands and the security of data held by NRCS offices. A question was asked about whether NRCS could or would share information with the EPA, but NRCS officials adamantly maintained the private data could not be shared between the agencies. Discussion over new wetland mitigation banking opportunities was of much lesser concern at the session. NRCS was given $10 million to establish more banks, and there is no longer a requirement that USDA be the easement holder for the banks. These new developments have spurred NRCS to seek out possible alternatives, and they are open to suggestions from the public. Specific questions they asked were: 1) should geographic areas be prioritized; 2) how can conservation partners and organizations be involved; and 3) what should a USDA conservation compliance mitigation banking program look like? Some suggestions included using the money for more compliance officers, ending acre-for-acre mitigation, focus more on functions and values rather than acreage goals, be geographically limited in scope. We will make a note for when the comments are posted in the federal register, supposedly happening this month.